The B-29 Superfortress bomber made its first appearance over Tokyo on November 1, 1944 - a single plane flying at 35,000 feet; beyond the reach of the defender's anti-aircraft guns and fighter planes. The intruder dropped no bombs. This was strictly a reconnaissance mission. The Superforts returned in force at the end of the month, flying at altitudes that insured immunity from attacks by Japanese defenders. Although their high altitude provided a shield for the bombers, it also decreased the accuracy and impact of their bomb runs. To correct this deficiency, Major-General Curtis Lemay (newly appointed commander of the American Bomber Command) ordered a dramatic change in tactics. The bomber runs would be made at night, at low altitude and deliver a mixture of high explosive and incendiary bombs. The objective was to turn the closely-packed, wooden homes and buildings prevalent in the Japanese cities into raging infernos and ultimately into the most destructive of all weapons - the firestorm. The Allies had first encountered the phenomenon of the firestorm when the British bombed the German city of Hamburg in August of 1943. The night raid ignited numerous fires that soon united into one uncontrollable mass of flame, so hot it generated its own self-sustaining, gale-force winds and literally sucked the oxygen out of the air, suffocating its victims. Lemay hoped to use this force to level the cities of Japan. Tokyo would be the first test. A successful incendiary raid required ideal weather that included dry air and significant wind. Weather reports predicted these conditions over Tokyo on the night of March 9-10, 1945. A force of 334 B-29s was unleashed - each plane stripped of ammunition for its machine guns to allow it to carry more fire-bombs. The lead attackers arrived over the city just after dark and were followed by a procession of death that lasted until dawn. The fires started by the initial raiders could be seen from 150 miles away. The results were devastating: almost 17 square miles of the city were reduced to ashes. Estimates of the number killed range between 80,000 and 200,000, a higher death toll than that produced by the dropping of the Atomic Bomb on Hiroshima or Nagasaki six months later. "They set to work at once sowing the sky with fire." "They set to work at once sowing the sky with fire. Bursts of light flashed everywhere in the darkness like Christmas trees lifting their decorations of flame high into the night, then fell back to earth in whistling bouquets of jagged flame. Barely a quarter of an hour after the raid started, the fire, whipped by the wind, began to scythe its way through the density of that wooden city. This time again, luck - or rather, the American command's methodical planning - spared my district from direct attack. A huge borealis grew over the quarters closer to the center, which had obviously been reached by the gradual, raid-by-raid unrolling of the carpet-bombing. The bright light dispelled the night and B-29s were visible here and there in the sky. For the first time, they flew low or middling high in staggered levels. Their long, glinting wings, sharp as blades, could be seen through the oblique columns of smoke rising from the city, suddenly reflecting the fire from the furnace below, black silhouettes gliding through the fiery sky to reappear farther on, shining golden against the dark roof of heaven or glittering blue, like meteors, in the searchlight beams spraying the vault from horizon to horizon. There was no question in such a raid of huddling blindly underground; you could be roasted alive before you knew what was happening. All the Japanese in the gardens near mine were out of doors or peering up out of their holes, uttering cries of admiration - this was typically Japanese - at this grandiose, almost theatrical spectacle. The bombs were falling farther off now, beyond the hill that closed my horizon. But the wind, still violent, began to sweep up the burning debris beaten down from the inflamed sky. The air was filled with live sparks, then with burning bits of wood and paper until soon it was raining fire. One had to race constantly from terrace to garden and around the house to watch for fires and douse firebrands. Far-off torch clusters exploded and fell back in wavy lines on the city. Sometimes, probably when inflammable liquids were set alight, the bomb blasts looked like flaming hair. Here and there, the red puffs of antiaircraft bursts sent dotted red lines across the sky, but the defenses were ineffectual and the big B-29s, flying in loose formation, seemed to work unhampered. At intervals the sky would empty; the planes disappeared. But fresh waves, announced in advance by the hoarse but still confident radio voice, soon came to occupy the night and the frightful Pentecost resumed. Flames rose nearby - it was difficult to tell how near - toward the hill where my district ended. I could see them twisting in the wind across roofs silhouetted in black; dark debris whirled in the storm above me." "Hell could be no hotter." The bombers' primary target was the neighboring industrial district of the city that housed factories, docks and the homes of the workers who supplied the manpower for Japan's war industry. The district hugged Tokyo Bay and was densely-packed with wooden homes lining winding streets that followed random paths - all the ingredients necessary for creating a perfect fire storm. "Around midnight, the first Superfortresses dropped hundreds of clusters of the incendiary cylinders the people called "Molotov flower baskets," marking out the target zone with four or five big fires. The planes that followed, flying lower, circled and crisscrossed the area, leaving great rings of fire behind them. Soon other waves came in to drop their incendiaries inside the "marker" circles. Hell could be no hotter. The inhabitants stayed heroically put as the bombs dropped, faithfully obeying the order that each family defend its own home. But how could they fight the fires with that wind blowing and when a single house might be hit by ten or even more of the bombs, each weighing up to 6.6 pounds, that were raining down by the thousands? As they fell, cylinders scattered a kind of flaming dew that skittered along the roofs, setting fire to everything it splashed and spreading a wash of dancing flames everywhere - the first version of napalm, of dismal fame. The meager defenses of those thousands of amateur firemen - feeble jets of hand-pumped water, wet mats and sand to be thrown on the bombs when one could get close enough to their terrible heat were completely inadequate. Roofs collapsed under the bombs' impact and within minutes the frail houses of wood and paper were aflame, lighted from the inside like paper lanterns. The hurricane-force wind puffed up great clots of flame and sent burning planks planing through the air to fell people and set fire to what they touched. Flames from a distant cluster of houses would suddenly spring up close at hand, traveling at the speed of a forest fire. Then screaming families abandoned their homes; sometimes the women had already left, carrying their babies and dragging crates or mattresses. Too late: the circle of fire had closed off their street. Sooner or later, everyone was surrounded by fire. The police were there and so were detachments of helpless firemen who for a while tried to control the fleeing crowds, channeling them toward blackened holes where earlier fires had sometimes carved a passage. In the rare places where the fire hoses worked - water was short and the pressure was low in most of the mains - firemen drenched the racing crowds so that they could get through the barriers of flame. Elsewhere, people soaked themselves in the water barrels that stood in front of each house before setting off again. A litter of obstacles blocked their way; telegraph poles and the overhead trolley wires that formed a dense net around Tokyo fell in tangles across streets. In the dense smoke, where the wind was so hot it seared the lungs, people struggled, then burst into flames where they stood. The fiery air was blown down toward the ground and it was often the refugees' feet that began burning first: the men's puttees and the women's trousers caught fire and ignited the rest of their clothing. Proper air-raid clothing as recommended by the government to the civilian population consisted of a heavily padded hood over the head and shoulders that was supposed chiefly to protect people's ears from bomb blasts-explosives, that is. 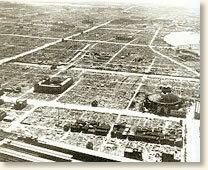 But for months, Tokyo had mostly been fire-bombed. The hoods flamed under the rain of sparks; people who did not burn from the feet up burned from the head down. Mothers who carried their babies strapped to their backs, Japanese style, would discover too late that the padding that enveloped the infant had caught fire. Refugees clutching their packages crowded into the rare clear spaces - crossroads, gardens and parks - but the bundles caught fire even faster than clothing and the throng flamed from the inside. Hundreds of people gave up trying to escape and, with or without their precious bundles, crawled into the holes that served as shelters; their charred bodies were found after the raid. Whole families perished in holes they had dug under their wooden houses because shelter space was scarce in those overpopulated hives of the poor; the house would collapse and burn on top of them, braising them in their holes. The fire front advanced so rapidly that police often did not have time to evacuate threatened blocks even if a way out were open. And the wind, carrying debris from far away, planted new sprouts of fire in unexpected places. Firemen from the other half of the city tried to move into the inferno or to contain it within its own periphery, but they could not approach it except by going around it into the wind, where their efforts were useless or where everything had already been incinerated. The same thing happened that had terrorized the city during the great fire of 1923: ...under the wind and the gigantic breath of the fire, immense, incandescent vortices rose in a number of places, swirling, flattening sucking whole blocks of houses into their maelstrom of fire. Wherever there was a canal, people hurled themselves into the water; in shallow places, people waited, half sunk in noxious muck, mouths just above the surface of the water. Hundreds of them were later found dead; not drowned, but asphyxiated by the burning air and smoke. In other places, the water got so hot that the luckless bathers were simply boiled alive. Some of the canals ran directly into the Sumida; when the tide rose, people huddled in them drowned. In Asakusa and Honjo, people crowded onto the bridges, but the spans were made of steel that gradually heated; human clusters clinging to the white-hot railings finally let go, fell into the water and were carried off on the current. Thousands jammed the parks and gardens that lined both banks of the Sumida. As panic brought ever fresh waves of people pressing into the narrow strips of land, those in front were pushed irresistibly toward the river; whole walls of screaming humanity toppled over and disappeared in the deep water. Thousands of drowned bodies were later recovered from the Sumida estuary. Sirens sounded the all-clear around 5 A.M. - those still working in the half of the city that had not been attacked; the other half burned for twelve hours more. I talked to someone who had inspected the scene an March 11. What was most awful, my witness told me, was having to get off his bicycle every couple of feet to pass over the countless bodies strewn through the streets. There was still a light wind blowing and some of the bodies, reduced to ashes, were simply scattering like sand. In many sectors, passage was blocked by whole incinerated crowds." Guillain, Robert, I Saw Tokyo Burning (1981); Werrell, Kenneth, Blankets of Fire: US. 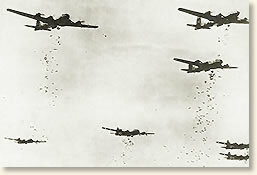 Bombers over Japan During World War II (1996). "The Incendiary Bombing Raids on Tokyo, 1945," EyeWitness to History, www.eyewitnesstohistory.com (2004).